OCT 1 If you’re still in the mood, there’s plenty to plant now, like shrubs, trees, roses, spring bulbs, lilies, garlic, rhubarb and cover crops. Don’t fertilize, but do use root starter. OCT 2 Beware moose on the make. Rutting moose will charge just about anything, and they can run 35 miles per hour. And their front legs are longer than the back ones, so they can easily jump over obstacles. OCT 3 The only known population of Pyrrocohoris apterus, or firebugs, outside of Europe is in SLC. Firebugs look like boxelder bugs, but are brighter red, sport two black dots, and can’t fly. If you see one, the Natural History Museum of Utah would like to know: Report sightings at www.inaturalist.org /projects/firebugs-of-utah. OCT 4 Because they contain varying amounts of water, no two opals (October’s birthstone) look the same. Individual stones also change over time, as the water evaporates and stress cracks form. OCT 5 Look for Saturn to the left of the waxing Moon tonight. Saturn was the father of Jupiter in Roman mythology. OCT 6 John Warnock, co-founder of Adobe Systems and Salt Lake City native, was born on this day in 1940. OCT 7 Tonight is the Draconids meteor shower. While not a great show, it is a convenient one, as the best viewing time is early evening. OCT 8 Poison ivy never goes dormant, so stay vigilant. It usually has three broad, spoon-shaped leaves that turn lovely red in fall, and grows below 6,500 feet in shady areas near water. It’s unfortunately common along the Bonneville Shoreline Trail. OCT 9 FIRST QUARTER MOON. Urushiol, the oily allergen found in poison ivy, can remain active on shoes and clothing for six months. Dogs can also carry urushiol on their fur, so bathe or wipe down your buddy (and toss the cloth) after hiking. OCT 10 Time to blow out and shut off the sprinkler system, drain and store hoses and cover hose bibbs. OCT 11 This is the earliest recorded first frost date for SLC. When a freeze is predicted, cover tender crops with sheets, tarps, buckets, cardboard or whatever. OCT 12 I’m seeing lots of American red squirrels around the valley. This time of year they’re filling their middens with conifer cones to munch during bad weather. Squirrels also eat seeds, nuts, berries, mushrooms, flowers, bark, bugs, eggs, and nestling mice, birds and rabbits. (Ick.) They gnaw into maple trees, too, to feed on the sap. OCT 13 American red squirrels vigorously defend their territory, which is usually bequeathed by the mother squirrel. OCT 14 A group of squirrels is called a scurry or dray. OCT 15 Indian summer, a period of warm, sunny weather following a cold spell, often occurs around now. OCT 16 FULL HUNTERS MOON/ SUPERMOON. The moon’s orbit around Earth is changeable; sometimes it’s oval, sometime more round. So its distance is changeable, too. Thus supermoons; full or new moons that are closer than usual. This month and the next two have full supermoons. OCT 17 Juncos and mountain chickadees are moving down to the valley. California quail are forming coveys. Mule deer, which, like red squirrels, are increasingly common in valley neighborhoods, are forming herds. OCT 18 It’s a good idea to vacuum out the clothes dryer vent at least once a year. Dryer fires are surprisingly common. OCT 19 Brine shrimp are laying their eggs, called cysts, in the Great Salt Lake. Nearly half of the world’s commercial brine shrimp, which are used to feed farmed fish, come from the GSL. Five million-plus water birds also depend on GSL brine shrimp for food. OCT 20 Mushrooms are more closely related to humans than to plants. That’s why fungal infections are so hard to fight without harming ourselves. OCT 21 The Orionides meteor shower, remnants of Comet Halley, peaks tonight. OCT 22 LAST QUARTER MOON. It’s time to cut back raspberry canes and vines, and winterize ponds. OCT 23 Time, too, to check the weather stripping around the doors and windows. Sealing gaps can reduce your energy bill 10-15%. OCT 24 Rattlesnakes are returning to their hibernaculum, prior to entering brumation, the reptilian version of hibernation. Upwards of 1,000 rattlesnakes may gather in a single hibernacula, which they’ll also share with turtles, lizards, other snake species and even small mammals. OCT 25 Have trees close to your house? Rain gutter covers are a good idea. Otherwise, you’ll need to clear the gutters after all the leaves fall. OCT 26 AVERAGE FIRST FROST. If you pot amaryllis, daffodils, hyacinths, paperwhites or tulips now you’ll have flowers in December. OCT 27 Patrick Fugit, star of Almost Famous (my favorite movie) and nephew of Catalyst cofounder Victoria Fugit, was born on this day in 1982. OCT 28 It’s uncomfortable for cats to eat or drink from a narrow bowl that pushes against their ultra-sensitive whiskers. There’s even a name for it: whisker stress. OCT 29 The first known vegetable lanterns were carved from gourds by the Maori over 700 years ago. Jack-o-lanterns originated in Ireland in the 19th century, and were made from turnips or mangel-wurzel (a type of beet). Irish immigrants, fleeing the Great Famine, brought the tradition to America in the mid 1800s. OCT 30 NEW MOON. 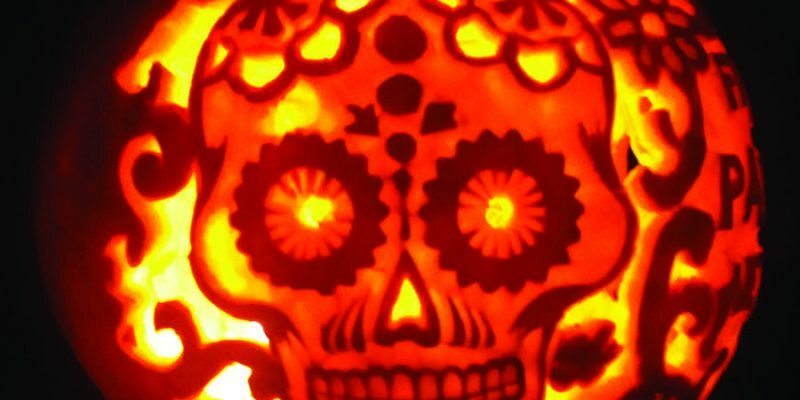 Pumpkins originated in Mexico between 7000 and 5500 B.C. Those grown specifically for eating are smaller, sweeter and less watery than the ones sold for carving. Pumpkin flesh, flowers, leaves and seeds are all edible. And good for you. OCT 31 Halloween, originally called Samhain (summer’s end), was celebrated by the Celts as the end of the harvest season and the time when the veil between the living and the dead is thinnest. In much of the world, it’s still a time to honor the dead, and food and other offerings are left out to feed and appease the spirits.